← Francophiles, Big Bad Wolf Fans, and Paris Lovers: This Post Is for You! 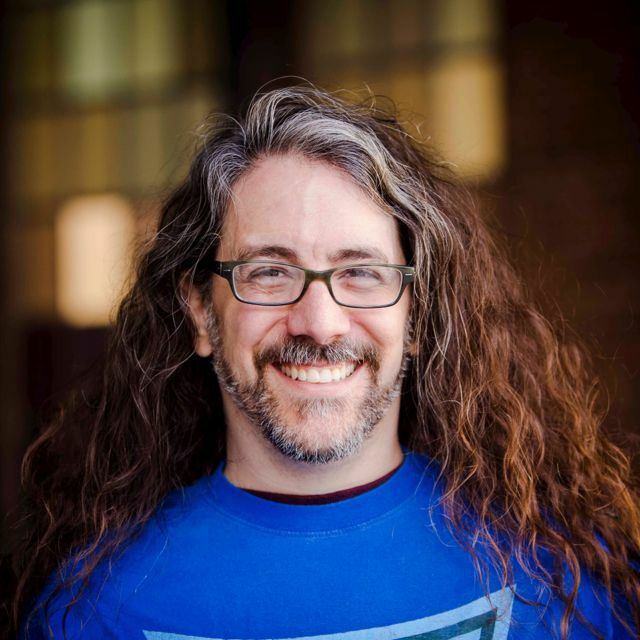 I am thrilled to interview the super funny and wildly creative, Adam Lehrhaupt, today. Adam has traveled to six continents, performed on Broadway, and lived on a communal farm. He firmly believes that opening a book is a good thing, even if there are monkeys in it. Adam lives in the suburbs of Philadelphia, PA, with his wife, two sons, and two of the most bizarre little dogs that you will ever meet. In his spare time, Adam does a bit of writing. His writing spans multiple styles, from poetry to fiction to nonfiction, and is primarily geared towards children. 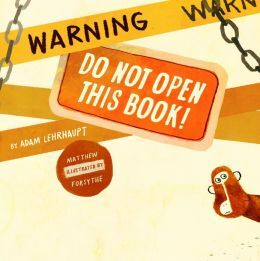 Adam’s first book, Warning: Do Not Open This Book! (illustrated by Matthew Forsythe, Simon & Schuster), is coming out on August 27, 2013. Adam, thanks so much for taking the time to do this interview. My pleasure, Robin. Happy to be here. For some reason I feel like that should be read in a pompous newscaster voice. Can we do that? *Pompous newscaster voice* “My pleasure, Robin. Happy to be here.” Ah, much better. Thanks. Holy Smokey, Batman! You’ve had a lot of really interesting jobs—from artist, to working for a lighting company that lead you to tour with The Allman Brothers, Dave Mathews Band, Boys II Men, to working with Dave Copperfield on Broadway, to working on a kibbutz, and to becoming a Senior Art Director for a gigantic international corporation. How did ALL of this lead you to writing children’s books? I’ve had an affinity for writing since high school. I wrote snippets of stories or ideas in the margins of all my books. When I was on tour and traveling, I kept a journal. Eventually, I sat down to write my great American novel. It was going to be full of war and politics and deep thinking, but what came out was a goofy little poem about a puppy. Instead of struggling to write my novel, I continued to write what came out. At first, it was just a lot of simple rhyme, but eventually I started writing some manuscripts. Not good manuscripts mind you, that came later. But it was something with a beginning, middle, and end. On your blog, you write about the “fine art of failing to succeed.” What does that mean to you? It means that you shouldn’t be afraid of failure. A lot of great success stories start with colossal failures. Henry Ford had to fail numerous times before he found success with the Model T. Einstein followed some wayward paths before coming up with his theory. There are mounds of great failures that produced something great. 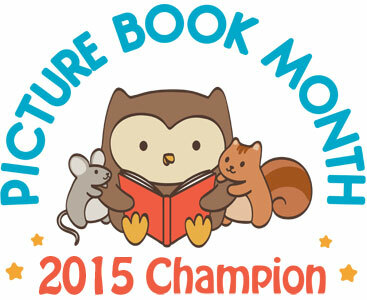 I failed to write the novel that I wanted, but succeeded at writing a great picture book. Failing successfully is an art that few people practice. You have to be open to change. You need to be willing to try new things. And, you need to embrace your failures. I fail spectacularly. It’s really something to see. So, when I heard the title of your book: Warning: Do Not Open This Book!, I knew this book was written for impatient, non-listening tykes like my little angel. How did the book come about? And how did you come up with that awesome title? In spring of 2010, my family and I took a trip to Roatan, Honduras. The resort we stayed at had a troupe of monkeys. By the early afternoon, these monkeys would be running around the beach stealing drinks, sunglasses, suntan lotion, and generally making a nuisance of themselves. Every time we saw them, my kids would yell, “Naughty monkeys!” It became a mantra. I started wondering what would happen if I put these monkeys in a book. What would they do? What trouble could they cause? Thus, my manuscript was born. Yes, I did just find a way to squeeze ‘thus’ into a sentence. Doing a happy dance now. The title came from my publisher. I think it’s great because it invites kids to behave like the Naughty Monkeys that the story is about. The book trailer is beyond adorable! And I love the music. Did you get to work on the trailer, as well? I did. It was a lot of fun. I storyboarded the whole thing myself and a friend helped put it together. The music is from Conan the Barbarian, the original Arnold version, not that no-Arnold-having remake. It’s actually the song my wife walked down the aisle to. I’m told our wedding was quite the spectacle. I know writers and illustrators don’t generally collaborate. Has this been your experience? Yep. I didn’t even speak to Matt until this past December when everything was all finished up. He’s an awesome illustrator. I couldn’t be happier with what he did on this book. I sometimes wonder what would be different if we had talked before he started drawing, but the illustrations are so cool. All things considered, I’m glad it worked the way it did. Since you are an artist, have you also thought about illustrating? I go back and forth on this. Some day I might illustrate something, but right now I’m enjoying the collaborative process. There is something awesome about seeing your ideas through someone else’s filter. If done the right way, they become better than they could have been if you had done it all yourself. That said, we’ll see. Especially if I write something with lots of skulls and roses in it. I’m awesome at 1980’s hair metal album art. Can you give your fans the scoop on some of your current projects? I have a few finished manuscripts, I’m adding to my poetry collection, and I’m writing, writing, writing. Hopefully the monkeys will have some more adventures. If they can behave themselves. You know how monkeys can be. How can your fans get a hold of you if they’d like you to do a school visit? The best ways to reach me are through email me@adamlehrhaupt.com, on Twitter (@Lehrhaupt) or my facebook page (facebook.com/adamlehrhaupt). I also show up if you shine the Adam logo into the night sky. Or I would. If there was a big light with an Adam logo on it. And how can they buy your book? Warning: Do Not Open This Book! will be available via Indie and chain booksellers worldwide, starting August 27, 2013. Madeleine, my faithful, over-worked, ever-hungry, ill-mannered four-legged companion (and as you can see a trained killer! 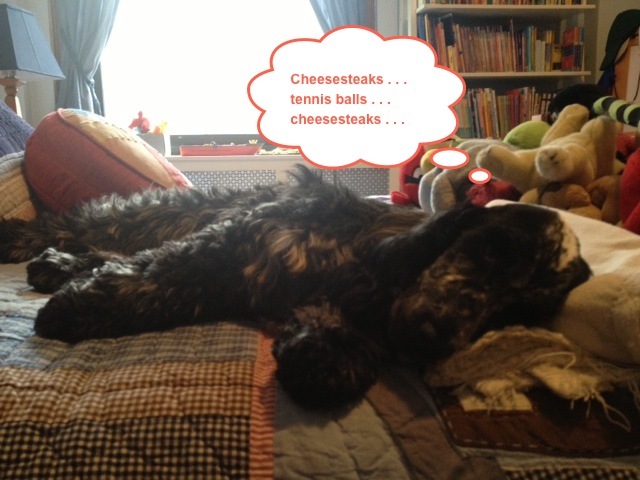 ), would like to know if your bizarre little dogs have an opinion on the best Philly cheesesteaks? 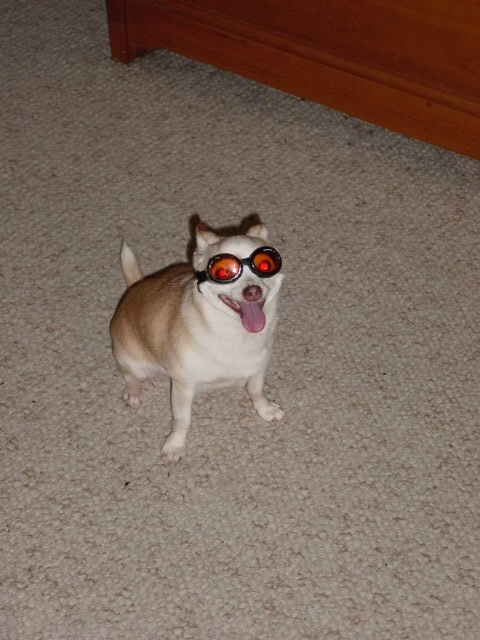 The 19 year old Chihuahua, Hui, would say Mike’s, on South Street, is the best. They chop up the meat real well and he’s not doing so well in the tooth department anymore. These things are important to him. 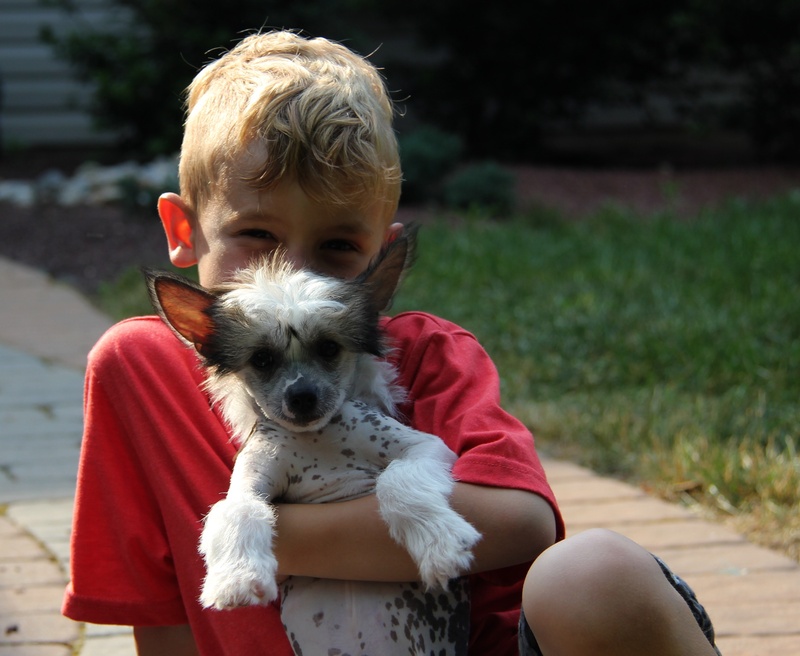 The new guy, Thor, is a Chinese Crested. He doesn’t eat people food. Not because he doesn’t like it, but because it doesn’t agree with him. If he did, I imagine he’d go with Pat’s or Gino’s. He’s trendy like that. With him, it’s all about how cool he looks. And by the way, what makes your bizarre little dogs so bizarre? Chihuahuas are just odd little animals. They shake for no apparent reason. They bark when they should be quiet and hide when they should bark. Hui’s no different. He’s all mixed up. Thor is a whole different story. Chinese Crested dogs are one of the hairless breeds. He just has hair on his head, paws and tail. It’s very bewildering. Neither animal will go outside in the cold or rain. They’re just strange. To me, a dog should be larger and mostly weather ambivalent. Needless to say, I didn’t have much say in our dog choices. Lastly, do you have any advice for new authors? Write. Then write some more. If you’re writing for kids, join SCBWI. Go to some conferences or events. Join a critique group, or find someone who will give you an honest critique of your work. Most importantly, don’t be afraid to fail. Adam, thanks again for doing this interview. All the best and much success. Thank YOU Robin. This was a lot of fun. Keep your eyes peeled for Naughty Monkeys. They can cause quite the ruckus. By rnewman504  Tagged Adam Lehrhaupt, Matthew Forsythe, Warning! Do Not Open This Book! Wow this interview is quite the ruckus. What an exciting background you have, Adam. Congrats on your monkey book it looks lots of fun. Thanks Catherine. I’ve has so much fun with WARNING. I can’t wait to share it with everyone. Thanks Susanna. I’m glad you liked the interview. What a great interview. Good luck with the book Adam. Can’t wait to read it! Thanks. Only a few more hours and It will be available everywhere. Yipee! Nice interview! The cover just screams for kids! Can’t wait to read it. I appreciate what you said about failing many times before you can succeed! Thanks Tinamco. It’s something that I think not many people understand or embrace. Don’t be afraid to fail, but also don’t be afraid to succeed. Right? Robin Newman did this wonderful interview on her blog “Let’s Talk Books” and I wanted to share it with all of you. Thanks Darlene. I had a lot of fun answering Robin’s questions. Angela, It’s a super fun read. I hope your kids like it. My son and dog both loved it! So, I guess that’s a 2 hands and 4 paws from us. And congratulations on all your wonderful work with the kids. I’ve enjoyed following your blog.